The most amazing thing about working as a journalist is the chance you get to have great, insightful, curiosity-stoking conversations with people – conversations which you document. I write stories about mountain life. And people. In this small way, I’m doing my best to stop time. Or at least, slow it down, just a little. And when people die, as they are sadly all too wont to do, I am so grateful for the chance I had to sit with them, our attention completely focussed on the single conversation at hand. I think of the late Florence Petersen, Doug Deeks, Bruce Edmonds, Wolfgang Klautt, and Sarah Burke – and feel grateful. 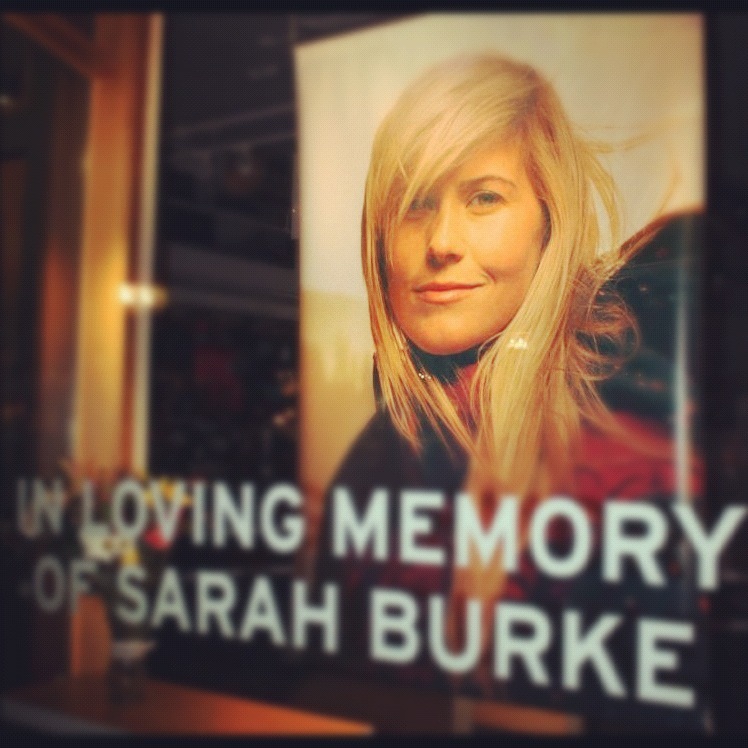 The one year anniversary of Sarah’s passing has just passed, and the twittersphere and interwebs are abuzz with remembering and news of the foundation launched in her honour. I interviewed Sarah back in 2008, as I was starting to do a bunch of pre-Olympic stories. She was 26 and one of the most recognizable skiers in North America, having won every major competition in superpipe and slopestyle in the previous two years, with golds from the X Games, the Nippon Open, the World Skiing Invitational, Japan World Cup and the FIS World Cup. Powder magazine had named her one of the most influential skiers of the past 35 years, FHM magazine named her one of the hottest women alive, and she was the first skier ever to win an ESPY award for Female Action Sports Athlete of the Year 2007, from the American sports cable channel ESPN. As for me – I was pretty much a nobody, writing for little publications and grassroots magazines and constantly hustling for another story, another byline. Sarah returned every call or email or request I sent her on frantic deadline, from wherever she was on the road, without any suggestion that my bona fides were less than A-list. She was a star, but her sport wasn’t yet an Olympic discipline. Going into the winter of 2008-2009, the 2010 Games was a year away and buzz was building about lobbying attempts to get halfpipe recognised as an Olympic sport, something that was looking increasingly unlikely for 2010 because of the molasses-clogged machinations of the IOC. 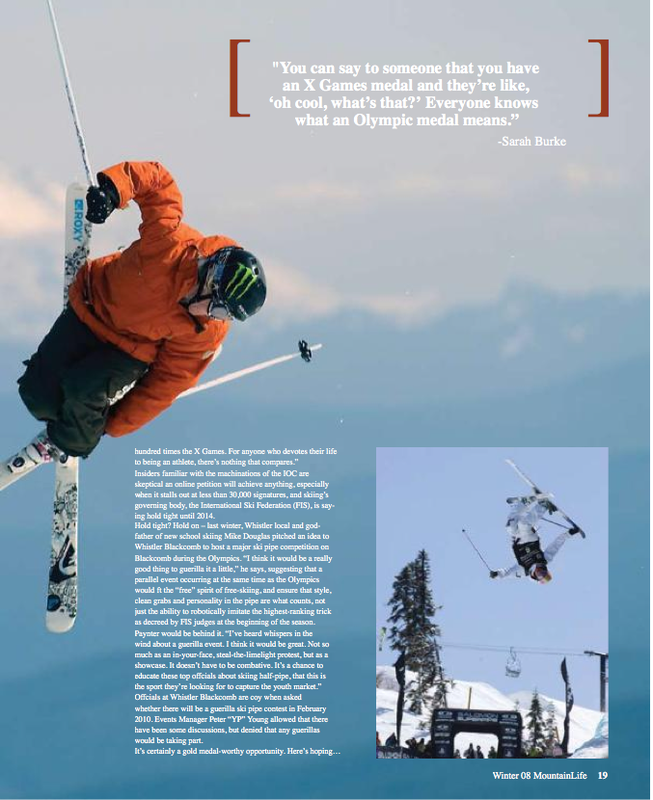 Sarah, a veteran at accomplishing the improbable, (at 18, she had begun a lonely campaign to have women included in the X Games, competing against the men in order to be part of the field, and then saw women’s competitions added to most of the major events), was 100 per cent behind the campaign to take bring ski pipe into the Olympics. But yesterday, I pulled out my old notebooks to see if I had any transcripts from those interviews with Sarah. I found 2 pages of my hard-to-decode handwriting with Sarah’s name scribbled across the top and re-read a skip-around-conversation that was rooted in a long-gone time and place. It didn’t amount to much, really. Just one golden pull-quote, and an enduring sense of admiration for a true trailblazer. Hail the Queen.